On this day in 1556, Hugh Latimer, Bishop of Worcester, was burned at the stake. However one feels about his theology, I’m pretty sure everyone agrees that tying a 78-year-old man to a stick and setting him on fire falls under “things your Sunday school teacher warned you against,” but this was the sixteenth century, and religion was England’s favorite competitive bloodsport. In tussles between competing views of what it means to be Christian, “martyr” is an intentionally loaded word. Latimer made plenty of martyrs himself, before you go all soft around the edges for him – most famously, he preached during the burning of a Franciscan friar whose pyre was stoked by the wooden statue of St. Derfel, from a shrine in North Wales. (No matter where you turn in English history, somebody is screwing the Welsh.) 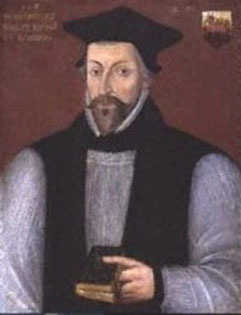 That friar, John Forest, was later named a martyr by the Catholic Church, and Latimer, along with his fellow bishops Cranmer and Ridley, is an official martyr of the Anglican Church. You can’t kick a rock in sixteenth-century England without turning up a martyr for somebody’s faith, and I don't say that to minimize or dismiss any faith: these were deeply held, deeply significant differences of opinion, with real world consequences for people’s lives, and they were right to argue and dispute and hold their ground. I just wish they had confined it to shouting and throwing scones at each other, but history would have to wait another few centuries (and another continent) before it could conceive of a place where the John Forests and the Hugh Latimers of this world could live side-by-contentious-side. 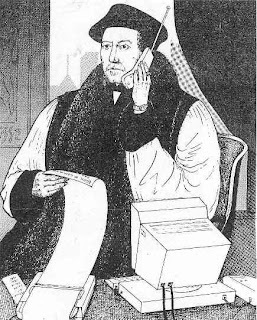 Before he went up in a puff of smoke, one of the things Cranmer managed to do was write a new daily office for the Church. (Okay, to be fair he wrote an entirely new way of worship for the Church, and say what you will, but Jesus that man could write.) Those with time on their hands could examine all of Cranmer’s re-structuring of English worship, but I think just looking at Morning and Evening Prayer, as he re-imagined them, is a perfect microcosm of what it was Cranmer was aiming at. You might notice these columns are largely the same – sure, there are differences in the order of stuff (Anglican office reserves the hymn to the end), some of the stuff might get switched out (the Anglicans change out the Our Father for the Creed, fewer collects in the Catholic office), and some of the padding might get removed (no antiphons on the psalms in the Episcopal office), but pretty much it’s all the same basic idea: you chant a few psalms, a few canticles, a few short prayers, and on you go with your day, please try not to burn anybody at the stake. In other words, Cranmer shifted the focus of the daily office from the praise of God, to the instruction of man. The single most time-consuming part of the office was no longer the chanting of psalms and canticles to God’s honor and praise, but the didactic Bible-reading. And by the way, those readings are long enough that there is no comfortable way to chant them, as one can in the Catholic office, so a “sung office” is really Bible reading with intervals of song: what had been an opera becomes a musical. To many Reform-minded and evangelical Christians, this is all to the good. Plenty of people prefer musicals to operas, and both definitely have their place. You can also manipulate one of these offices into looking more like the other: if you are praying the Catholic office in Lent or Advent, for instance, and you want to combine some lectio divina with your daily prayers, you can tote along your Bible and expand what the office supplies. Or, if you are praying the Anglican office, you can (as I have often done) simply omit the clunky Biblical inserts altogether, and glide from Psalms to Canticles to Creed. But of course, in doing that, I am de-Cranmerizing the office, and arguably undoing what he would have thought of as the entire point. (I’m pretty sure Cranmer’s issues with me would not end with my mangling of his lovely office, but we could maybe start the conversation there.) I have found the Scriptural inserts unwieldy and beside the point – if I want to read the Bible I’ll do it when it’s not smack in the middle of my prayers, thank you – and I tend to toss them out like the shrink-wrapping on a lampshade, but for many others, reading is a form of prayer, and the office works as a seamless whole. For me, reading is a form of reading. Cranmer is not taking my calls, really at all. A final quibble with the Anglican office is its lack of propers outside of a collect for saints’ days. A daily office is unbeatable for those of us with attention-deficit issues (ooh! a saint’s day! ooh! new psalms! and antiphons! different hymns! different collects!) and the Anglican office does not bend in all the places I would like it to bend, with a supple acknowledgement of the wind-and-tide shifts on the Kalendar. For instance, Catholics on this day are not stuck commemorating the sticky and complicated legacy of the Oxford Martyrs – they get St. Margaret Mary Alacoque, visionary of the Sacred Heart and founder of that devotion, so for someone like me with a devotion to the Sacred Heart, it’s great to spend your office focusing on something of interest to you. But of course, that lack of flexibility comes from strict use of the Prayer Book, and I know for a fact many Anglican monastic communities use variations of the Prayer Book Office that do supply saints’ offices and antiphons. This discussion avoids entirely the other two forms of daily prayer I am familiar with: the Orthodox Christian daily office (as contained in the Horologion) and the Jewish daily prayers (meaning Shema and Shemoneh Esrei, at a minimum). However, neither of those allow for much (if any) variation, so I will be honest and say I have had trouble mining spiritual fruit from them, and sticking with them long-term. I would be curious to hear the experiences of other regular office-prayers, and what they have found to work or not work over the years.